During the same day, Pharaoh gave command to the slave master to force the Israelites to make bricks without giving them straws. The slave master obeyed Pharaoh and never gave the Israelites straw to make bricks. So the Israelites had to find straw to make the bricks. This had increased the burdens of the Israelites. When the Israelites couldn’t meet the quota of the bricks, the slave masters beat them. The people complained to Moses. Moses prayed to the Lord for help. Moses and Aaron went to Pharaoh and did as God commanded them. And the staff turned into a serpent. Pharaoh called his magicians to do the same but Moses’ serpent swallowed the magician’s serpent. And Pharaoh’s heart became hard and refused to let the Israelites go. So The Lord sent the first plague on Egypt. He turned the water in the Nile River into blood. The water in the river had a foul smell and the Egyptians had no water to drink. Pharaoh’s magicians did the same. Pharaoh’s heart grew hard and refused to let the Israelites go. God told Moses to stretch out his staff over the streams, river and ponds so that frogs will come up on the land of Egypt. Moses did as God commanded him and all the frogs come up on the land of Egypt. The frogs were so numerous that it covered the whole land of Egypt. Moses prayed to God to take away the frogs from Egypt. God listen to Moses’ prayer and all the frogs in Egypt died. When Pharaoh saw that the frogs are no more, his heart became hardened and refused to let the Israelites go. Moses obeyed the Lord and strikes the dust in the ground with his staff and they become lice throughout the land of Egypt. The lice were on the Egyptians and livestock. Pharaoh’s magician tried to do the same but they couldn’t. Pharaoh’s magician said to Pharaoh, “It must be God who had done all these things.”Pharaoh refused to listen and his heart is hardened. So the Lord sends the fourth plague of flies to Egypt. God sent a thick swarm of flies on Egypt. The flies enter the house of Pharaoh and Pharaoh’s servants and all the land of Egypt. So Moses prayed to the Lord to take away the flies. The Lord listened to the prayer of Moses and removed the flies from Pharaoh and his people. But when Pharaoh sees that there are no more flies, he broke his promise and never let the Israelites go. The Lord sent the fifth plague of diseases on the livestock of the Egyptians. The livestock of the children of Israel were not affected by the pestilence. All the livestock of Egypt including horses, donkeys, camels and cattle died from the disease. But Pharaoh’s heart hardened. Pharaoh still refused to let the Israelites go. Moses and Aaron did as the Lord commanded them and the boils were on all the Egyptians. The plague of boils was so serious that the magicians couldn’t come and stand before Pharaoh. Yet, Pharaoh’s heart became hardened and refused to let the people of Israel go. Moses obeyed God and told Pharaoh exactly what God told him to say. Pharaoh refused to listen and let the Israelites go. 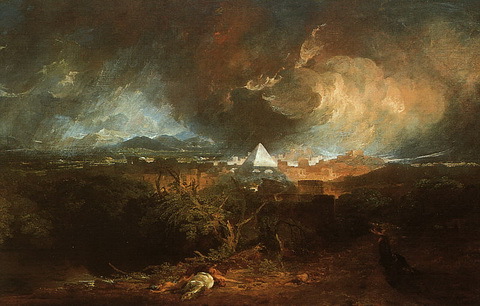 So God rained thunder and hail on Egypt and fire comes down to the ground from the sky. The hail destroyed all the flax and barley crops. Pharaoh heart was hardened and did not let the Israelites go. Moses obeyed God and stretched out his hand over the land of Egypt. Then God sent an East wind and blew all the locusts to Egypt. There were so many locusts that it covered the whole land of Egypt. The locusts ate up every green leaves of the plants in Egypt. But Pharaoh still would not let the people of Israel go. So God sent the ninth plague of darkness over the land of Egypt. A thick darkness cover Egypt for 3 days and 3 nights. It was so dark that the Egyptians could see each other. But there was sunshine and light in the place where the Israelites live. Pharaoh still didn’t change his mind to let the Israelites go. And the Lord said to Moses, “I will bring the last plague on Egypt. I am going to bring death on the firstborns of the Egyptians. Afterward, Pharaoh will let you go. While you are leaving Egypt, you will take all the silvers, gold and jewelry from the Egyptians. During midnight, I will go into the midst of the Egyptians, and kill all the firstborn of the Egyptians. When midnight, the Lord went amidst the Egyptians and killed their firstborns. There were great cries in Egypt because there was not one household in Egypt with no one dead. When the morning comes, Pharaoh found out that his son was dead. Pharaoh was so angry that he commanded Moses to take the Israelites and leave Egypt immediately.